Open Letter to Standard Bank: Moving Forward or Treading Water in Shark-Infested Seas? [Update: 17 February 2011] After some aggressive petitioning Standard Bank’s twitter persons with cross-references to this post and other disgruntled customers, I got a phone call on the 10th to discuss my problem. A possible solution seems to exist. I’ve posted the documentation they asked for (a written request to reverse the stop on my card, which suggests it was lucky that my wallet turned up in the bus service’s lost property office) via registered mail. Whether I get access to internet banking without returning to South Africa remains to be seen. Perhaps the title of my letter is a little unfair. Perhaps you really are moving forward, but you’ve left your customers behind in the bloody water with the chum to fend for themselves. My experience with you has been a case study in client service failure. This case will be to Customer Relations 101 that Deep Horizon will be to Risk Management 101. That’s right Standard Bank—the disaster, that is your level of customer service, is on par with the “largest accidental marine oil spill in the history of the petroleum industry” in my opinion. Back in October 2010 I decided to take my son on an excursion to a Petting Farm in Edinburgh. On the way there the bus became very crowded, I become flustered with juggling a 2-year-old and all his associated paraphernalia, and I dropped my wallet. Relief of getting off the bus soon turned to panic at the realisation that my wallet was no longer in my possession. I headed home and reported the card lost. The friendly call centre person (and to your credit, the overwhelming majority of your staff are friendly—that is not my gripe) duely cancelled it. I imagined that there would be some pain in getting access to my bank account again, but didn’t expect insurmountable problems. Following a number of telephone conversations it become apparent that I wouldn’t be able to carry out any further transactions on my account, and that the call-centre people weren’t sure how to help me. I put my request for help in writing, certain that the email would get routed through the correct channels of your bureaucratic labyrinth. Eventual it would arrive on the desk of a wise being who knew what to do and had the power to do it. Whahahahaha! What an idiot I was. I’m currently living in Scotland and lost my debit card. I cancelled the card, but as a result can no longer carry out internet banking. For obvious reasons, I cannot just stroll into a local branch and pick up a new card. My expensive international phone calls first led me to believe that I could send someone else into the branch with my power of attorney, but further enquiries reveal that since the person will be issued with my pin number, that probably won’t be allowed. Right — so solve my problem. I want to be able to do internet banking from Scotland, without first returning to South Africa to collect a new debit card. What must I do, written in clear, easy to follow steps? And I really hope that Sacrifice a virgin to Baal isn’t one of the steps. I haven’t carried out any human sacrifices. Should I have? I suppose you can’t explicitly tell me to do that. The human-sacrifice aspect of your business is something you don’t talk openly about. Makes the investors nervous, hmm? Can’t see how throwing your customers to the sharks will make them any happier though. Or do you only feed the sharks with the customers who refuse to partake in cult behaviour? It’s all very confusing. Perhaps a FAQ on your website dealing with this might help. Looking back now, I think your reference to Baal was right there staring me in the face. “Should [I] require further assistance” was clearly a suggestion to ask for guidance on carrying out the required sacrificial rites. The rites needed to get Internet Banking reactivated without going to a branch. In simple terms, this is how you’ve failed me and what you need to do to redeem yourself. Your Solution 1: Collect a new card and pin at your nearest branch, link Internet Banking to this new card. My problem is: I cannot collect card at nearest branch as nearest branch is over 9000km away from my current location. Your Solution 2: While customer has no card, repeat Solution 1. That’s it. I’m stuck in this infinite bureaucratic loop and I cannot find anyone with higher enough privileges to break it. It’s not even a complicated algorithm where this problem is deeply nested within the possibilities of customer difficulties, and could not have been foreseen. I can accept that through some oversight in planning a simple potential issue like this might be overlooked, and as a result no procedure was drawn up to deal with it. This left the poor disempowered call-centre and email customer support employees unable to fix the problem. What I can’t accept is that given this situation, where the support decision is locked in an infinite loop, is there is no procedure for breaking the loop by escalating the problem to a higher support level. If such a procedure exists, then every person who has dealt with my enquiries is either completely ignorant of the procedure, or completely incapable of abstract thought. 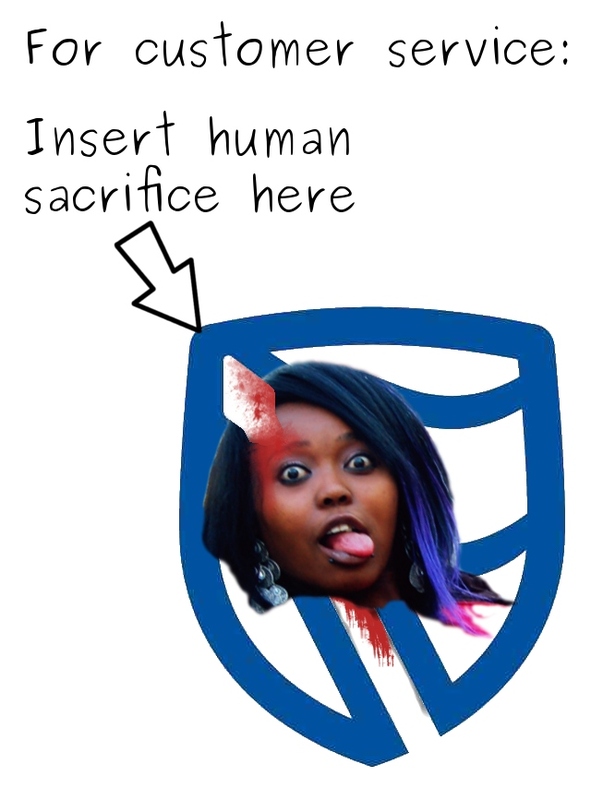 The lack of abstract thought possibility does lend some weight to my Standard Bank is a Murderous Cult theory. Resolving my problem may not be trivial within the constraints of your internal systems but, assuming you are not in fact a violently murderous cult populated with mindless drones, how can there be no manual overrides for any of your procedures? Please, before I am forced to carry out some arcane ritual in a fit of desperation, sort this out. This is not the full extent of the pain and grief Standard Bank have put me through. More on Standard Bank’s ineptitude. ProTip™ for other Standard Bank customers in my predicament. A careful look at the first step in the infinite loop I’m condemned to shows that the problem should never have arisen in the first place. The “Internet banking is linked to an active bank card” clause is completely unnecessary. Other banks don’t do this. Why does Standard Bank have to? Author Neil RobinsonPosted on 8 February, 2011 17 February, 2011 Categories business, ranting waffleTags baal, Bank, complaints, customer service, fail, human sacrifice, logo vandalism, marketing, moving forward, Online banking, sharks, south africa, Standard Bank, tagline, virgin sacrifice3 Comments on Open Letter to Standard Bank: Moving Forward or Treading Water in Shark-Infested Seas? We’ve been living in Edinburgh for about two and a half months now, which is enough time to get halfway settled, and certainly enough time for some spection. Cutting through the blubber of my experiences. Feels like a strangely appropriate metaphor. We’re living in Edinburgh. We found affordable (at the moment) shelter. It has the things we need, like beds, an oven, refrigerator, TV, heating, hot water. It’s in a decent area. We have public transport. We can get around the city as we need to. Haven’t had any real need for a private vehicle so far (although missing buses can sometimes be a drag). We found Jethro a nursery to meet other children. He goes three times a week for 5 hours. We’d send him more but it costs a lot. Disclaimer: I am predisposed to melodrama. Vivisected whale metaphors included. I also feel that tweeting has done my writing of lengthier, thoughtful pieces, a disservice. Underemployment is arguably better than unemployment, but both are a rocket-harpoon to the belly of your ego. The ego doesn’t really survive being disembowelled, so instead it is reincarnated into some other form. My current place of underemployment is at a telephone call centre, as a market research telephone interviewer. Good thing I spent all those years of pain getting that Chemical Engineering degree under my belt! It’s a job that is less terrible than one might imagine, and really makes me wonder why I bothered educating myself at all. It’s straightforward work. It isn’t stressful (once you get some experience). And you get a broad range of interaction with the human condition — a fascinating and often hilarious sample of the world of people out there. It really can be quite entertaining. The work isn’t exhausting either, leaving me some energy for more creative pursuits. At least, I’d have more energy if I didn’t have to match a 2-year-old’s endless supply. Two-year-olds are the solution to our fossil-fuel economy, if only we can find an efficient way to harness them as a power source. All I needed to do was kill my Chemical Engineer self, and replace it with a more humble accepting self. One that had lower expectations. Or perhaps the humble one was there all along, getting trampled on and being ignored. Not exactly suicide, but some sort of psychological insurrection is running its course within me. I’m hoping to limit the collateral damage. I’m not the only underemployed one in my household. Angie is struggling with some underemployment issues herself. Considering her epic CV, this is really a bit of a mystery. The recruitment agents keep putting her name forward for jobs. The insane employers keep not employing her. It’s not really a total mystery. We have our suspicions about the problem, but all I’ll say is this: The Nazis had an over-developed sense of nationalism. I know about Godwin’s Law. I don’t care. Well it is in the whaling nations, but not so much in Edinburgh. There are good things, so I probably should try to bring some balance to this woeful account of my woeful woes. Pavements: They have them here in the UK because the powers that be aren’t entirely taken by surprise by the fact that one may want to walk from point A to point B. I note this because of the stark contrast to South Africa. In South Africa the municipality seems to believe that it’s only worthwhile building pavements for the rich people, and since the rich people drive everywhere, they don’t bother laying too many pavements. In the UK a huge amount of consideration goes into how a pedestrian might get access to something. While doing maintenance on the road, the builders are likely to close off massive stretches of road to vehicular traffic, in order to ensure that pedestrians can still walk safely. Brightly coloured barriers guide us safely along. I’ve noticed less jay-walking in Edinburgh, than I experienced in South Africa, but the reason isn’t what you might expect. British people are just as inclined to jay-walk as any one else in South Africa would be, but in South Africa the powers that be have more important things to worry about. In Edinburgh the city council puts up all manner of barriers along the road to discourage people crossing the roads at convenient places. People sort of bounce off the barriers in a confused manner, and slowly shuffle their puzzled sheeple bodies over to the pedestrian crossing points. Keeping us all safe from ourselves, as any good nanny-state should. Dog-fouling: The thing about having pavements is that dogs can crap on them. This can cause quite a bit of consternation, with dire warnings posted everywhere regarding the terrible financial consequences of allowing your dog to foul the verges and pavements. The £100 fines don’t deter every dog owner, as I frequently discover that my shoes have become malodorous due to a misstep of mine. Perhaps those were stray dogs? Silly rules about alcohol: South Africa certainly had stupid rules about the sale of alcohol. Only licensed liquor stores can sell all types of alcohol, but not on a Sunday after a randomly chosen time. Supermarkets are only allowed to sell wine. Licensed restaurants can sell any type of alcohol at any time, including on Sundays when the retail places have to close their doors. It’s sort of nuts in Edinburgh too, but there are extra levels of complexity that are, frankly, incomprehensible to me at the moment. Supermarkets sell wine and malt, but the licensing in the restaurants is weird. We tried going out with Jethro in tow on a Sunday evening and were turned away from several pubs because of the child — but for different reasons. At one establishment, Jethro got us barred because he was under the age of five and the restaurant/bar didn’t have small child facilities. At the next place, we were barred because children weren’t allowed after 5pm, and at the place where we finally stopped, we were barred because children weren’t allowed on the premises at all. How is it that we stopped where children were not allowed on the premises? Jethro was asleep in his pram, so we sat on the edge of the pub’s property, and placed Jethro on the other side of an imaginary line which marked the boundary between the pub property and the neighbouring property. Comparison of the air: The air in Edinburgh is cleaner than it is in Johannesburg. Evidence, other than the fact that one cannot see the air in Edinburgh (while this is possible during winter in Jozie), is that my asthma is gone. Perhaps the lower altitude, and consequential higher concentrations of oxygen are helping me out there too. The air is colder though. It’s October now, and the frosty chill in the atmosphere is getting noticeable and I know it is only a an aperitif before the main course of winter. I’m going to miss the African summer, methinks. Walking around at night: People do this in Edinburgh. People do this in Johannesburg. Life expectancies are vastly different between those two populations of nightwalkers. Not saying I haven’t come across some dodgy folk on my night adventures around Edinburgh. Just saying that I haven’t taken any extensive nightwalking samples in Johannesburg. Public transport: I’ve been using the buses in Edinburgh, and they are excellent (except the No.10 which generates a disturbing resonance when the engine idles, causing my brain to rapidly oscillate around inside my skull, bashing the sides and making me feel quite nauseous). They have a different approach to service than the South African mini-bus taxis. Buses in Edinburgh stop at the designated stops. South African mini-buses stop anywhere the customer is or wants to be. Buses in Edinburgh adhere to passenger capacity limits. South African mini-buses ignore passenger capacity limits. Buses in Edinburgh leave a stop once the passengers waiting get on. South African mini-buses leave the stop when the mini-bus is full. Buses in Edinburgh have their drivers intimidated by antisocial passengers. South African mini-buses have their passengers intimidated by antisocial drivers. Buses in Edinburgh have bus lanes reserved for them. South African mini-buses have to reserve normal or emergency lanes for themselves. I think both parties could learn something from the other one. I think I need to meditate more on patient acceptance. Previously I reviewed a film called Revolutionary Road, and I mentioned it doing something life-changing to me. I watched that film, and rated it more depressing than Schindler’s List (which was certainly no happy adventure film) because it looked like my life. I’d never been directly affected by the holocaust, and could maintain a level of detachment from the atrocious events portrayed in Schindler’s List. By any objective measurement, Revolutionary Road is a far less disturbing film than Schindler’s List—unless you find yourself living on Revolutionary Road. My life of cautious pragmatism. My life of radical ideas and conservative action (or sometimes, just non-action). My house on Revolutionary Road. A new radical idea hatched in Angie’s and my shared consciousness. The idea: hoist our lives out of South Africa and deposit them somewhere in the United Kingdom. It could have been more radical. We could have decided to go to Afghanistan, but our radical ideas are still tethered to cautious pragmatism. This time, we’re following through on the action. We’ve bought the plane ticket and Angie, Jethro, and I will be in the UK at the beginning of August. The Bean-dog will be following once we find a place to settle. The Kelty-dog is going to the Geriatric-Services Doggie-Retirement-Home (aka my parents). (although Angie came close; still looking). It’s madness! But it feels good. It feels like being alive again. Can someone explain why governmental bureaucrats like to shut down or cripple successful projects, just because they didn’t think of the idea? This innovative prisoner rehabilitation project, for example. Please can we work together on these social issues. If someone else gets something right, rather build on it and make it better, than be jealous and break it down. It really doesn’t have to be a zero-sum game. Everyone can benefit. Perhaps there is a valid reason for discontinuing the project that has been poorly communicated. Perhaps it’s just biased reporting. But if the responsible officials don’t respond to the reporter’s requests for comment, it is rather difficult for the reporter to present the government’s viewpoint. 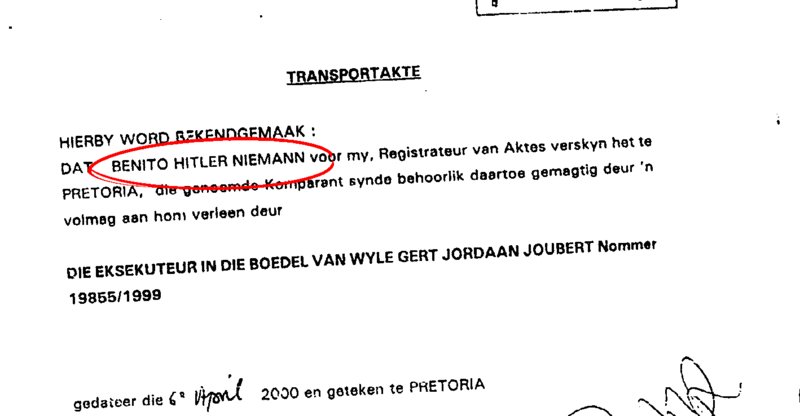 As part of my work I have to look at title deeds. Benito Hitler Niemann was on one of them. Jacob Zuma has declared that he’s not even half guilty of corruption charges levelled against him. Interesting that he doesn’t just say he’s innocent. So how guilty are you JZ? A quarter? An eighth? Perhaps a third? When the court finds one three sixteenths guilty, does one serve a pro rata sentence?